Beautiful Cars at an Important Announcement in Pittsburgh! 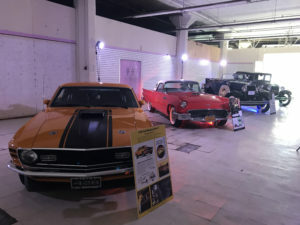 Fort Pitt Classic Cars was invited to participate in a joint press release by UPMC & the University of Pittsburgh announcing the upcoming $200 million renovation of a former Ford assembly & showroom building on Baum Blvd for cancer and aging research. 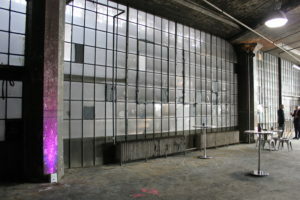 The 200,000 square-foot building was initially built by the Ford Motor Company in 1915 for the assembly of the Ford Model T.
Fort Pitt Classic Cars provided a 1930 Fort Model A, 1957 Ford Thunderbird and 1970 Ford Mustang Mach 1 to highlight the advancement of Ford automobiles in the past 90 years. 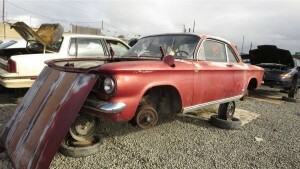 The Chevrolet Corvair became quite notorious by the middle 1960s, but in 1963 it was still a reasonably mainstream compact, selling in respectable numbers. Enough of these cars are still sitting in backyards and driveways to result in a steady trickle of Corvairs into California self-service wrecking yards. Here’s one that I found in a San Francisco Bay Area yard.